Who we are and what we do: Family-owned and operated, Gator Chef is a leading supplier in the restaurant supply industry. For many years Gator Chef has provided both new and used restaurant equipment to meet the needs of any type of business. Be it a five-star restaurant, diner, sports bar, catering company, or anything in-between, we have you covered. By supplying large products such as commercial cooking equipment, as well as small products such as cookware and food pans, we aim to keep all our customers satisfied. Our Experience: Gator Chef has a staff with over 100 years of combined food industry experience. Our people have been in your shoes as experienced chefs, owners/operators, commercial kitchen designers, and equipment technicians. We aim to meet the needs of all our customers, so it’s not unusual for our team to follow up with you after an order and offer a few tips about set-up and maintenance. At Gator Chef we also don’t like beating around the bush. Our team includes shipping in the bottom line price. That way you know your total cost up front. We also are a bit faster than you might imagine. Our team ships most orders same day. 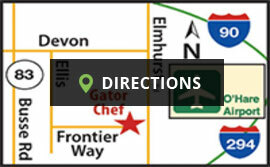 Our Location: Located just west of Chicago near O’Hare Airport, Gator Chef has two showrooms open to the public so you can find what you need right away. No matter what type of product you need, big or small, Gator Chef has the equipment from trusted manufacturers. Read about it for yourself, browse our reviews by verified buyers from Gator Chef. Gator Chef is a proud member of the Illinois Restaurant Association.